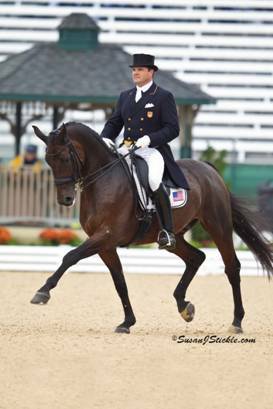 Todd Flettrich has been teaching dressage clinics at Oak Hill Farm in Lockport Illinois for several years now. Our Trainer at Oak Hill Farm, Amy Lewis, had followed Todd’s Career with great Interest and she had decided that he would be the right person to help her, as well as all of us boarders, to advance the horses (and riders) at our barn to higher levels. Todd Flettrich is a native of New Orleans, Louisiana. He began riding at age 12 and soon discovered his love for dressage. He participated four times in the North American Young Riders Championships (NAYRC) bringing home the individual gold medal in 1991 and thus helping his team win the silver medal that year. He went on and started to coach and he helped his student Lean Anne Neal win the Individual Gold Medal at the NAYRC in 1994 and Catherine Malone was able to win the Individual Gold Medal in 2005. He is now based in Coatesville, Pennsylvania and spends the winter month in Wellington Florida. He has earned his USDF Silver and Gold Medals and graduated from the USDF ‘L’ (Learner) Judge Program. You might have heard or read about him this year as well. He was chosen to compete at the World Equestrian Games in Kentucky for the U.S. Team and he truly had a very busy year preparing for the Games. Todd and his grand prix mount “Otto” left in June for Germany to train with his friend Hubertus Schmidt. “Otto” (Rambo x Rampal) is a 14 year old Danish Warmblood gelding owned by Margret Duprey of Cherry Knoll Farm. 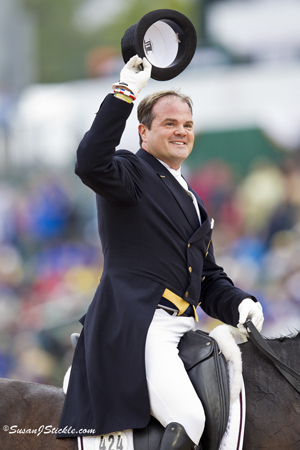 Todd was invited to compete at the prestigious World Equestrian Festival at CHIO in Aachen, Germany on July 9-18th 2010. It’s the #1 ranked horse show in the world and a great international competition that would prepare him for the 2010 Alltech FEI World Equestrian Games (WEG). Also planned were two smaller competitions in Fritzen, Austria and Falstebo CDI 5* in Sweden. Unfortunately Otto got a cold on his flight over to Europe and those two warm-up shows had to be scratched. Nevertheless, the pair did great and scored 67,812% to finish 17th in the Grand Prix. The next day they went on to compete in the Grand Prix Special and finished in the 21st position with a score of 66,875%. They were pleased with the results, competing against many of the best horses and riders in the world. Next stop was back in the U.S.A. The Dressage Festival of Champions at Collecting Gaits Farm in Gladstone NJ was the final competition for the Team Selection Trials for the WEG. Held over two weekends in August Otto and Todd did great. Placing third in both the Grand Prix and Grand Prix Special on the first weekend and then moving into second place in the overall standing after the second weekend. They scored and impressive 75.600% for their Freestyle. On to the Kentucky Horse Park and the 2010 Alltech World Equestrian Games. Otto and Todd had a great Grand Prix ride and were able to finish in 38th position. Competing against the best horses and riders in the world in a stadium filled with fans was a great experience and it is an important step for his future. Todd is prepared to work hard for the next two years to hopefully be once again part of the U.S. Team for the 2012 Olympic Games in London. Oak Hill Farm has previously had other great Instructors. Colonel von Ziegner, Gerhard Politz and Volker Brommann just to name a few. It is difficult to find the right Instructor/Clinician, because different rider and horse combinations have different needs and are usually training at different levels. To find an outstanding trainer who will work with horses and riders at all levels can be a challenge. To find someone who is liked by everyone….well that’s even harder. When Todd comes to our barn, he brings a laid back attitude to his lessons, which makes the horses and riders feel at ease. He creates a comfortable atmosphere that allows the rider to focus on the instructions rather than worry about mistakes. However, his calm way of instructing does not interfere with the quality of the lesson. My 9 year old Hanoverian Gelding “Weltstern” or short “Waldi” and I have been riding with him for the past two years and we have made great advancements with his help. My lessons with Todd always allow for a warm up period, during which he asses the horse and helps improves over all elasticity and engagement. We discuss the progress we have made since his last visit and then continue with the work on more advanced movements. He has a wonderful way of coming up with helpful exercises to improve the overall quality and execution of the movements. Thinking about his style of teaching, I cannot help but describe it as artistic. The most important objective for him is that the horse “wants to do the job for the rider”. As he likes to say:” It’s a team effort”. The thing that I really like about that is the fact that his lessons don’t end up in a “drilling” session. If horse and rider encounter a problem he works on other things that will later help overcome the original problem. This works great, because a lot of times it takes away the anticipation and leads to a successful execution. It’s simply a great way to teach. Drawing from his knowledge and experience he is confident in his approach. This is, in my opinion, what makes the difference between a good lesson and a great lesson. He never hesitates and is decisive and precise with his directions. \We are looking forward to having him back at Oak Hill Farm and of course we are wishing him the best of Luck for the future.